This is the engine well of the P26 and the fuel tank storage "cubby hole". There was no storage like this on the P26 before 1975 (see the P26 timeline page). 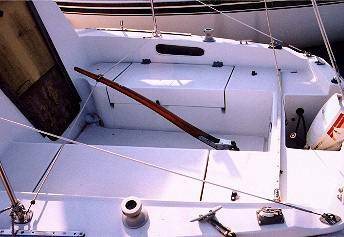 Originally there was a hose running from a thru-hull in the engine well to a thru-hull in the gas tank space for the fuel hose. It came into the engine well on the starboard side (dark circle). 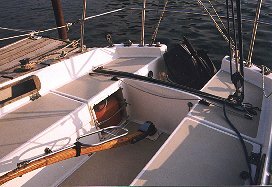 I replaced it with a PVC tube glassed in between the forward starboard corner of the engine well and the gas tank space. I run the fuel and electric through this tube to the gas tank space and from there the electrical runs into the cockpit locker and to the battery hookup. The PVC tube is the same as the one I used to enlarge the engine well drain. I used a hole saw and cut right into the corner. I filled the OEM hole in the side of the well with a light. Now my engine will never break down at night. The post 1975 P26 engine well is large enough to place an auxiliary fuel tank in the well with room to spare to tilt the motor up. The can shown here is a 3 gallon that we take along for cruises. A slightly larger gas can would probably fit but I don't know of one with the right configuration. 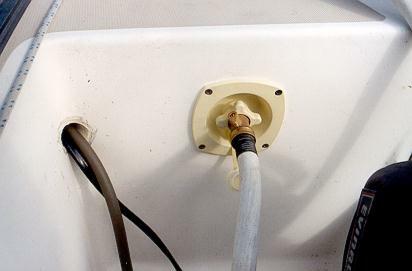 If needed we just pull the fuel line through the PVC tube and connect it to the fitting on the 3 gallon tank. 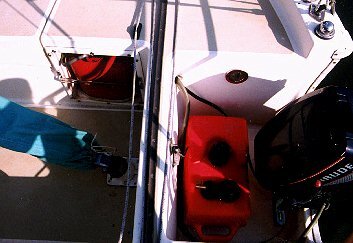 I think that's a safer and easier way to handle the fuel then trying to pour from a spare can into the main can while out on the water. Another P26 owner with a '76 model has found that the plastic 6 gallon OMC tank fits in the OEM cubby hole and fits in the engine well with the motor tilted up (He has an Evinrude 9.9).